The SU-85 is a Rank III Soviet tank destroyer with a battle rating of 4.3 (AB) and 4.7 (RB/SB). It was introduced during the Closed Beta Test for Ground Forces before Update 1.41. This vehicle is a successor of SU-122 bearing an 85 mm cannon instead of a howitzer. Front glacis has tracks placed on it, adding 18 mm at their location. Ammo racks of the SU-85. 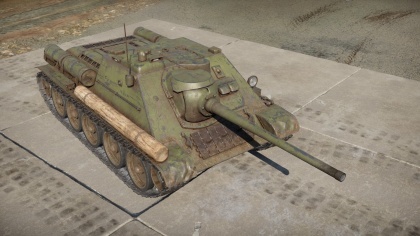 The SU-85, as a tank destroyer, should be played in a sniper format due to its powerful gun, but subpar armour. The 85 mm gun is able to take out many tanks at its battle rating due to being the lowest BR vehicle with the gun. However, the armour is only decent and is basically an enlarged T-34 front hull for front armour. At the battle rating, this armour quality is no longer able to withstand the enemy's shots such as that of the Panzer IV. Thus, this makes it a bad idea to be near the front line and instead sit back behind the fighting and take out distant enemy targets, maximizing the low silhouette to hide and distance to improve armour effectiveness. Be warned that penetrations from shells with explosive fillers are often fatal due to the cramped nature of the crew compartment. Either most of the crew will be knocked out or the modules damaged and these will drastically hinder the SU-85's ability to fight and survive. It is imperative that the SU-85 hit the enemy and be the first one to fire the 85 mm gun to win an engagement. This is especially true in realistic and sim battles where the low profile will grant the SU-85 an advantage of stealth. Good mobility akin to the T-34. Expect a lot of one hit KO's. 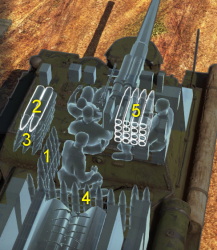 Armour is only that of a T-34's and will not stop many rounds. Small combat compartment can cause quick crew knock-out. The development for this vehicle began in 1943 to supplement the firepower the T-34 and KV-1 has. Before then, the T-34 and KV-1 tanks are more than adequate to deal with the German Panzer forces, but by the end of 1942, the appearance of the Tiger I revealed that the German armoured forces were becoming more developed and more armoured. This reveal showed the Red Army that needed better guns in order to deal with the rising threat of these new German vehicles. The search for a better gun led to the deelopment of the D-5 85 mm gun, which was a modified anti-aircraft gun made by design bureaus of Vasiliy Grabin and Fyodor Petrov. It was found that the new gun was unable to be mounted on the current T-34 or KV-1, so it was to be mounted as a self-propelled gun like the SU-122, which is a self-propelled gun made on a T-34 chassis. The vehicle to be produced was designated the SU-85 and was similar to the SU-122, just replacing the 122 mm gun with a 85 mm one. The gun that was to be mounted in the self-propelled configuration was designated the D-5S (S for self-propelled) and the vehicle was produced at the Uralmash factory. Modifications were made overtime during its production such as a telescopic sight and a new ball gun mantlet, these modified vehicles were designated the SU-85-II. Up to 2,050 units were produced from mid-1943 to late 1944. The SU-85 saw service in August 1943 in Soviet service, which coincides the time the Soviets engage in a counteroffensive against the the Battle of Kursk. It was praised for its low profile to be able to conceal itself and its excellent mobility. The initial production batch had low visibility due to lack of optics, with only four periscopes in the design, but this was improved on the SU-85M with a commander's cupola seen on the later variants of the T-34. The 85 mm gun was able to destroy a Tiger tank from 1000 meters out, proving much capable against the newer German tank designs. Though capable, its firepower was still seen as lacking considering the Tiger could still destroy it and T-34s from up to 2,000 meters away. 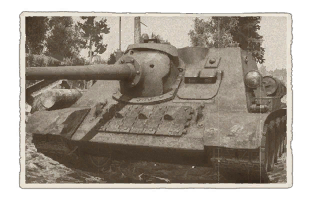 The lack of range on the SU-85, plus the uparming of T-34s from the 76.2 mm F-34 gun to the same 85 mm gun as well in the T-34-85 caused the production of the SU-85 to be cancelled in late 1944 as it no longer provided any beneficial firepower over the standard tank unit. Even after it was retired from Soviet service, replaced by the more powerful SU-100, it was exported to Soviet allies in the Warsaw Pact after World War II. The SU-85s were either kept as tank destroyers, or converted into armour recovery or command vehicles. These vehicles saw service in North Korea, Vietnam, and may still be in service today by Central European countries like Albania, Bulgaria, Yugoslavia, and Romania. Skins and camouflages for the SU-85 series from live.warthunder.com. This page was last edited on 11 January 2019, at 23:59.